CAHUITA – A few dozen meters from the Caribbean beach of Puerto Vargas, where you can barely see the white foam of the waves breaking offshore, is the coral reef that is the central figure of the ocean front of the Cahuita National Park in Costa Rica. Puerto Vargas is known for the shrinking of its once long beach, as a result of erosion. The coast has lost dozens of meters in a matter of a few years, which has had an effect on tourists and on the nesting of sea turtles that used to come to lay their eggs. Just as the beaches have been affected, there have been effects under water, in this area of the eastern province of Limón, which runs along the country’s Caribbean coast from north to south. “The impact of the rise in sea level and changes in temperatures also affect the coral ecosystems,” Patricia Madrigal, Costa Rica’s vice minister of environment, told IPS. The waters of the Caribbean sea are particularly fertile for corals, but the warming of the waters and acidification due to climate change threaten to wipe out these ecosystems, which serve as environmental and economic drivers for coastal regions. The most visible effect is the coral bleaching phenomenon, which is a clear symptom that corals are sick. This happens when corals experience stress and expel a photosynthetic algae, called zooxanthellae, that live in their tissues, producing oxygen in a symbiotic relationship. The algae are responsible for the colors of coral reefs, so when they are expelled, the reefs turn white, and the coral is destined to die. According to the latest report by the Intergovernmental Panel on Climate Change, published in 2015, there is clear evidence that 80 per cent of coral reefs in the Caribbean have bleached, and 40 per cent died during a critical period in 2005. This is a recurring phenomenon all over the world. The report projected that 75 per cent of coral reefs in the world would suffer severe bleaching by the middle of this century, if greenhouse gas emissions are not curbed. The coral reefs in the Caribbean make up about seven per cent of the world’s total, but play a key role in the economies of many coastal communities in the region. The conservation of coral reefs goes beyond defending biodiversity. Coral reefs provide a living to nearly one billion people, offer protection by buffering coastal communities against storms and heavy swells, and bring in billions of dollars a year from tourism and fishing. Because of this, experts from Costa Rica and the rest of the Caribbean region are calling for a halt to activities that cause global warming, such as the use of fossil fuels, and for research into how to restore coral reefs. However, Caribbean countries should also think about reducing pollution, said biologist Lenin Corrales, head of the Tropical Agricultural Research and Higher Education Centre´s (CATIE) Environmental Modeling Laboratory. “How do you maintain the resilience of coral reefs? By not dumping sediments or agrochemicals on them. A sick coral reef is more easily going to suffer other problems,” Corrales told IPS at CATIE´s headquarters. This argument is well-known in badly managed coastal areas: marine ecosystems suffer because of human activities on land and poor health makes them more vulnerable to other ailments. In fact, an academic study published in 2012 showed that coral degradation along Panama’s Caribbean coast began before global warming gained momentum in the last few decades. Researchers blame deforestation and overfishing. In terms of preparing for climate change, this means a step back: it is not possible to protect against future global warming ecosystems that the countries of the region have been undermining for decades. 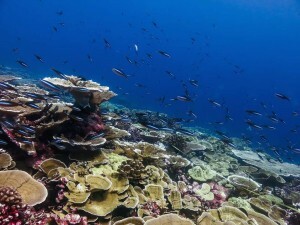 The sediments as a result of deforestation or poor agricultural practices prevent the growth of corals, while overfishing affects certain species key to controlling algae that infest the reefs. “Many of the fish that are eaten in the Caribbean are herbivorous and are the ones that control the populations of macroalgae that damage the coral,” said Corrales. “With the herbivorous fish gone, in addition to the higher temperatures, the algae have a heyday,” said the expert. A report published in 2014 by several organizations, including the United Nations Environment Program (UNEP) and the International Union for Conservation of Nature (IUCN), notes that the absence of crucial herbivorous fish such as the parrotfish jeopardizes the region’s coral reefs. How long will these undersea riches last? No one knows for sure. All scenarios project severe impacts in the following decades, after many reefs suffered critical damage from the 2015 El Niño Southern Oscillation (ENSO) weather phenomenon. That is why experts such as Corrales warn that far from expecting an increase of one to two degrees Celsius as some scenarios project, fast changes in temperature should be considered, such as those associated with El Niño. “People think that biodiversity is not going to die until the climate changes; but really biodiversity, and in this case coral reefs, are already suffering from thermal stress,” said the biologist. When a coral reef spends 12 weeks with temperatures one degree higher than usual, it can suffer irreversible processes, he pointed out. As the average sea level rises, it is more likely for the threshold to be reached, but even before that point it is also dangerous for coral. Stopping global warming does not guarantee a future for coral reefs, but it does give them better opportunities. A possible way forward is being developed by the Mote Marine Laboratory and Aquarium in Summerland Key, in the U.S. state of Florida, where researchers are growing corals in controlled environments to later reintroduce them in the ocean, as is done with seedlings from a greenhouse in reforestation efforts. “We can actually test to see which would have a given resistance to future conditions and in that way build a stronger ecosystem of survivors for what the next years might bring,” Dave Vaughan, the head of the lab, told IPS in an interview by phone. The team headed by Vaughan reintroduced 20,000 small corals to degraded areas of the reefs, in a process that will accelerate the recovery of these ecosystems. In 2015, the lab received an investment of 5.1 million dollars to make Vaughan´s ambition possible: reintroducing one million coral fragments in the next five to ten years. However, Vaughan himself admits that this is a mitigation measure to buy time. The real task to fight against climate change is reducing the emissions that cause the greenhouse effect. “Coral restoration can give us a 10, 50 or 100 years head start, but eventually if the oceans continue to rise in temperature, there’s not too much hope,” he said.